No. 51 (‘Señor Manuel Garcia’).—The Hired Frock-coat. No. 125 (‘Lamia’).—Leap Year. Lady proposing to her partner while sitting out at the Bachelors’ Fancy Dress Ball. No. 182 (‘A Roman Triumph’).—Return of the Aston Villa team to Birmingham after the final tie. No. 194 (‘The Morning of Sedgemoor’).—Back to the Land. City clerks sleeping in barn after haymaking. No. 279 (‘The Invaders’).—March of the Raunds bootmakers. No. 299 (‘Betrayed by the Moon’).—Baltic Fleet shooting torpedo-boat in mistake for trawler. No. 358 (‘Communal Sitting of the Burghers of Landsberg’).—The Bump Supper. The President of the Rowing Club obliges with a song. No. 425 (‘Columba in exile welcomes the Wild Birds that cross the sea from Ireland’).—Feeding the ducks in St. James’s Park in the Middle Ages. No. 432 (‘Alone’).—The Tripper. By the Silver Sea. No. 458 (‘Flora’s Bower’).—The Ladies’ Swimming Race. Chairing the winner. No. 491 (‘Lady Gorst’).—A Study in Scarlet. No. 625 (‘For he had spoken lightly of a woman’s name’).—The House of Commons on a Fiscal night. No. 681 (‘The Blue Carpet’).—The Spring Cleaning. No. 722 (‘Portrait of a Child’).—Mr. 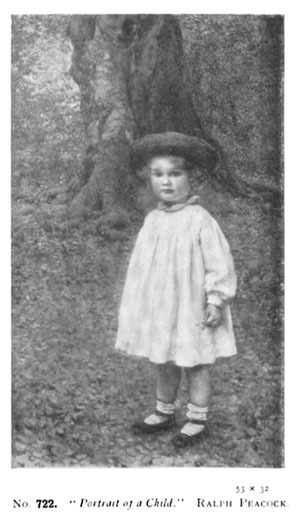 Winston Churchill, M.P. No. 729 (‘The Widow’).—Your food will cost you more. No. 761 (‘Our Handy Lads’ Nursery, Greenwich, 1905’).—Celebrating the anniversary of Indian Mutiny. Blowing men from the mouths of guns at Greenwich. No. 784 (‘Where hardy Thracians tame the savage horse’).—The start for the Derby. Cicero leading. No. 822 (‘Betrothed’).—The Rake’s Progress. No. 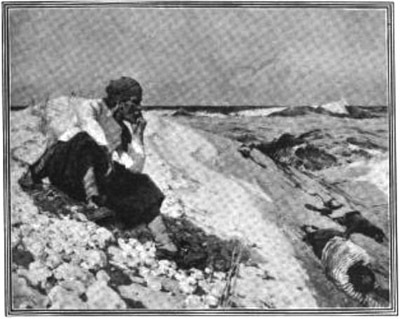 970 (‘A Dream of the Sorrowful Way’).—L.C.C. Improvements. The Strand at midday; road up. No. 994 (‘Cosmos’).—Push-ball. An exciting moment. No. 1316 (‘Mrs. 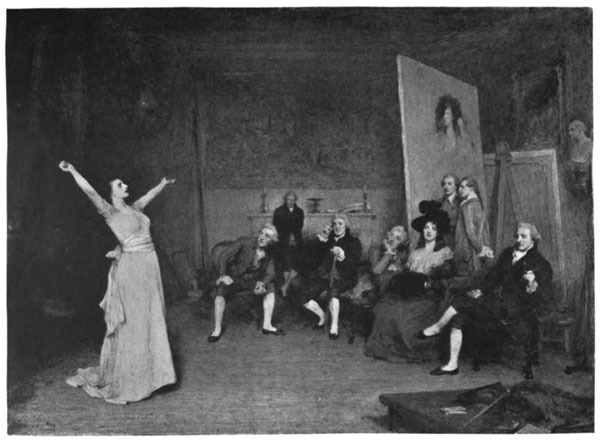 Siddons reciting in the Studio of Sir Joshua Reynolds’).—Ju-jitsu. The challenge. Printed unsigned; entered by Wodehouse in Money Received for Literary Work. Note: As with the previous year’s Academy Notes, Wodehouse is making facetious descriptions of real paintings shown at the Royal Academy Exhibition of 1905. All titles can be verified from the catalogue, but images and descriptions are not always available; what we have is below. For convenience, Wodehouse’s joking tags are reproduced following a long dash, below the information given. 51. 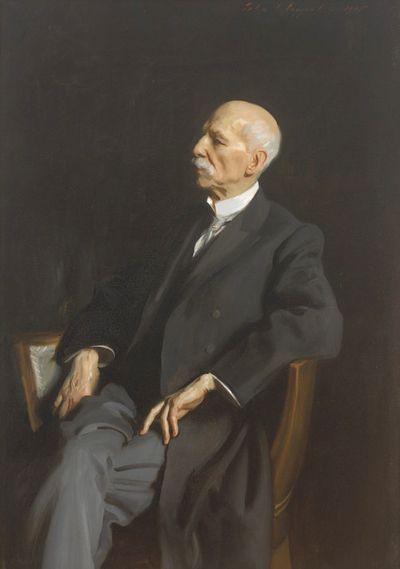 John Singer Sargent painted Manuel García (1805–1906), a professor at the Royal Academy of Music in London and the voice coach of legendary opera singers such as Jenny Lind, in celebration of his 100th birthday. 125. 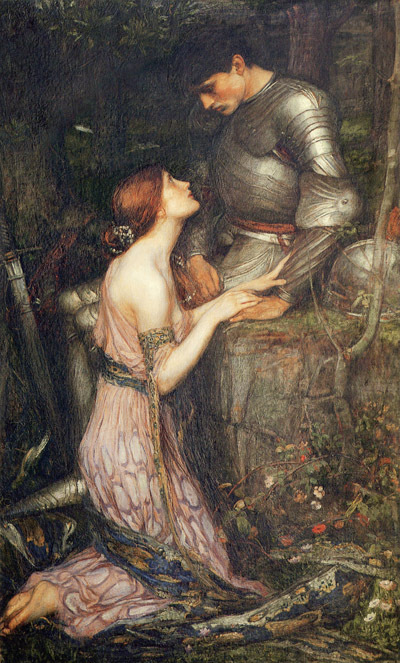 John W. Waterhouse (1849–1917) depicted Lamia and the Soldier. —Leap Year. Lady proposing to her partner while sitting out at the Bachelors’ Fancy Dress Ball. —Return of the Aston Villa team to Birmingham after the final tie. 194. 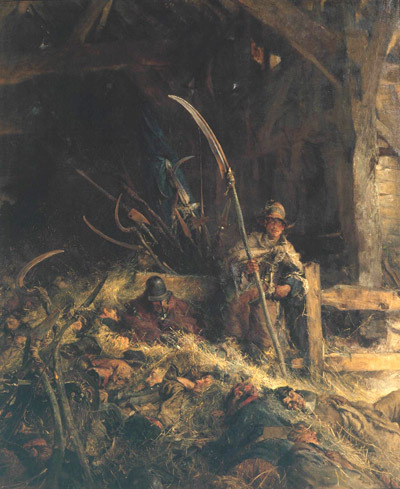 Edgar Bundy (1862–1922) depicted soldiers waking before the battle of Sedgemoor in 1685, at which James, Duke of Monmouth and Pretender to the throne of James II, was defeated. —Back to the Land. City clerks sleeping in barn after haymaking. 279. Edward Matthew Hale’s “The Invaders”: “a snow scene in a wide valley with rocks at the opposite side red in the setting sun, and in the centre a motley horde of men and horses struggling in a long line through the snow; a kind of idea, apparently, of the invasions of the Goths; it is a suggestive and original work.” (The Builder, June 3, 1905) Wodehouse refers to a 1905 march to London by the bootmakers of Raunds, who were striking for not being paid at the negotiated rate for their handmade army boots. See this article for more. 299. 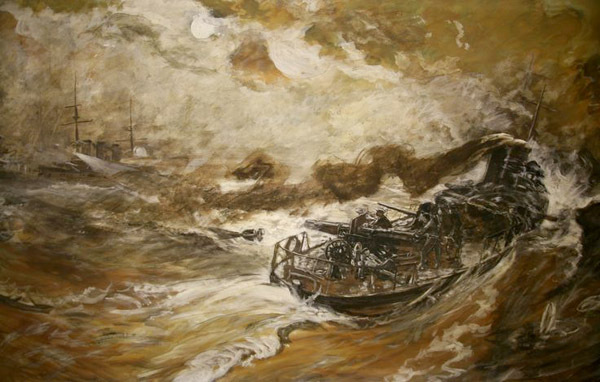 C. Napier Hemy (1841–1917) depicted a torpedo destroyer trying to approach a battleship at night being “betrayed by the moon.” Wodehouse refers to an incident in which Russian warships mistakenly fired on British fishing boats, discussed in a poem published earlier that year. —Baltic Fleet shooting torpedo-boat in mistake for trawler. 358. Herkomer’s Burghers of Landsberg, from a reproduction in the Sphere, May 6, 1905. The painting was 24 feet long! —The Bump Supper. The President of the Rowing Club obliges with a song. —The Tripper. By the Silver Sea. —The Ladies’ Swimming Race. Chairing the winner. 459. 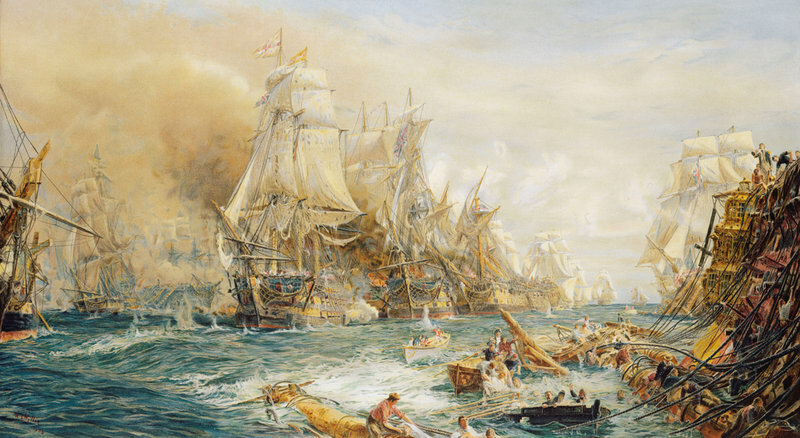 William Lionel Wyllie (1851–1931) painted the Battle of Trafalgar as it stood at 2:30 p.m. on October 21, 1805. 625. 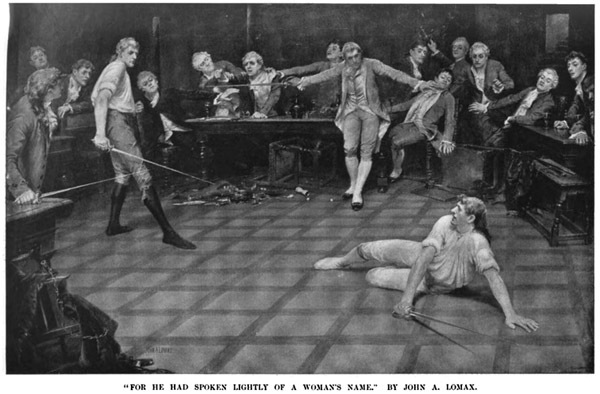 “For he had spoken lightly of a woman’s name” by John A. Lomax (1857–1923); image from Windsor Magazine, 1907. —The House of Commons on a Fiscal night. 722. 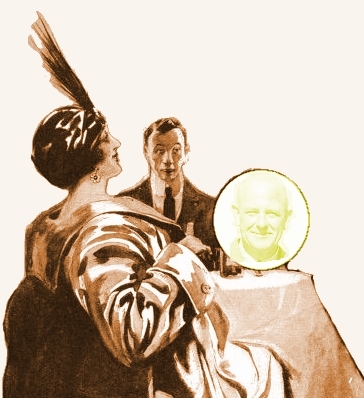 Wodehouse and his “By the Way” colleagues often poked fun at Churchill’s inexperience and impetuosity as a young Member of Parliament (first elected in 1900 at age 26). 729. 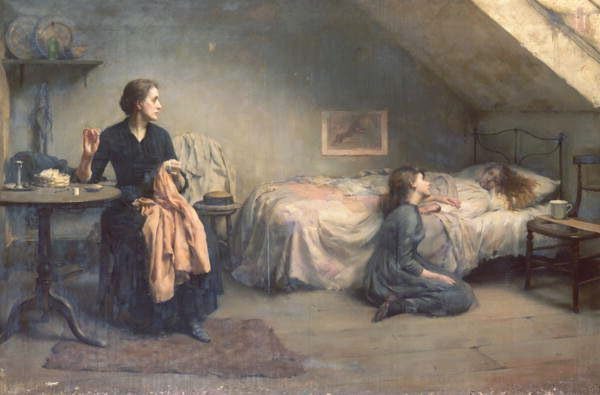 “The Widow” was one of many works by Thomas Benjamin Kennington (1856–1916) highlighting the pathos of the poor, widowed, and homeless inhabitants of London. I can find no image of the 1905 exhibition portrait, but at right is “Widowed and Fatherless” from 1888 to give an impression of his style. —The start for the Derby. Cicero leading. —L.C.C. Improvements. The Strand at midday; road up. 1316. The exhibited engraving by Frederick Huth follows the painting by W. Q. Orchardson, illustrated here.